Garlic is commonly used as a natural alternative to antibiotics – it can be used to treat infections and viruses, but it’s important to understand how to properly use this natural cure in order to get the full effect. Cooked garlic can be lovely as flavouring for your food, but when you cook garlic you lose some of the active ingredient a.k.a. allicin, a sulfer-containing compound found in raw garlic. Allicin is activated when raw garlic is chopped, crushed or chewed – but is deactivated by heat. The best way to consume garlic in order to get the maximum healing factor from it is to eat it raw 10 minutes after crushing or chopping it. Many people are put off by the smell and taste of raw garlic, and so opt to take it in the form of a pill. This is an easy fix, but as is often the case, the easy fix is less effective. Dried garlic is often heat- treated, which destroys the active ingredient allicin – just as with cooked garlic. For best results, fresh, uncooked garlic is the way to go. Fresh garlic is a much healthier option that garlic that has been sitting out for a long time. You can tell if garlic is fresh by slicing it open down the middle – if there is a green strip running through the centre of the clove, the garlic is fresh. 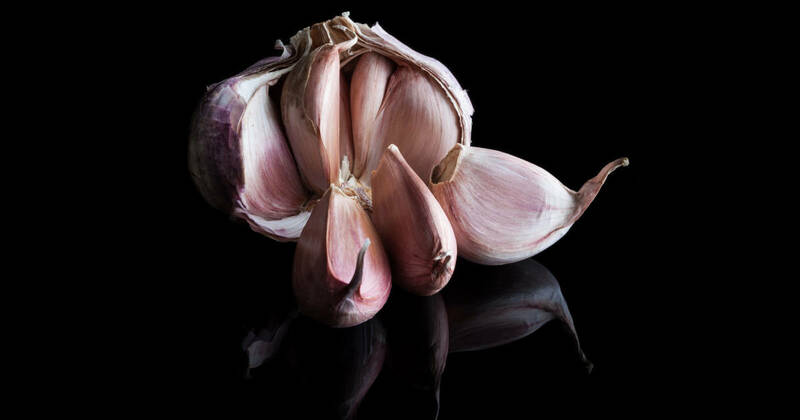 A therapeutic dose of garlic is generally larger than most people think it is – one clove of garlic a day won’t make much difference when you’re trying to fight off an infection. You’ll want to take two to three average to large-sized cloves each day. As a natural antibiotic, garlic can affect your stomach flora, depleting friendly bacteria and upsetting the delicate balance of your intestines. The best way to deal with this is by eating plenty of fermented foods – these contain vital probiotics to help replenish your natural bacteria stores. Kombucha, yogurt, kefir, fermented vegetables like sauerkraut and kimchi, and miso are among the foods you’ll want to try to take care of your intestines while taking garlic as an antibiotic. Garlic is a powerful natural antibiotic, but it can’t do all the work of fighting off illness on its own. It’s important to pair garlic with a healthy diet for the best possible effect. Try eliminating processed foods and refined sugars from your diet, and instead include plenty of fruits, vegetables, and healthy oils. Getting plenty of water is vital as well. If the idea of eating raw garlic turns you off because of the taste and smell, try mixing it with yogurt, honey, or another carrier agent to make it more palatable. To control the dreaded garlic breath, eat some fresh parsley afterwards to get your fresh, pleasant-smelling breath back. Additionally, while some people have had good results from taking garlic first thing in the morning, many others find that taking garlic on an empty stomach can cause digestive irritation. Start with small amounts and try to gauge how your body reacts; if you notice any bloating, nausea, diarrhoea or skin reactions such as a rash, consult your doctor – some people have an allergy to garlic, but are still able to consume it in small amounts. Garlic has a long history of medicinal use, even being used to treat cervical cancer and dysentery in Africa. With many health practitioners recognizing it’s medicinal qualities, it should be in everyone’s kitchen – not just as seasoning for your food, but ready for when infection or other illnesses strike.